It can be said that this could only be a stipulated "essence", which comes via the sortal concept [human]. It's not the essence of, say, an individual human (as an individualised particular) that he must be capable of learning a specific delineated language. In possible world terms, Tony Blair, for example, might have suffered from brain abnormalities which precluded him from being capable of learning the said type of language. Similarly, if Tony Blair as a baby had been captured by aliens and dropped onto an uninhabited planet (even if he had the correct brain functions required for learning language L), he still wouldn't have been capable of learning that language if the required stimulations weren't present (e.g., other L-speaking humans, etc.). We could ask here if a possible language-less Tony Blair might still have been a human being according to Chomsky’s stipulations. However, according to another stipulational definition, Tony Blair might still have been a human in that same possible scenario. 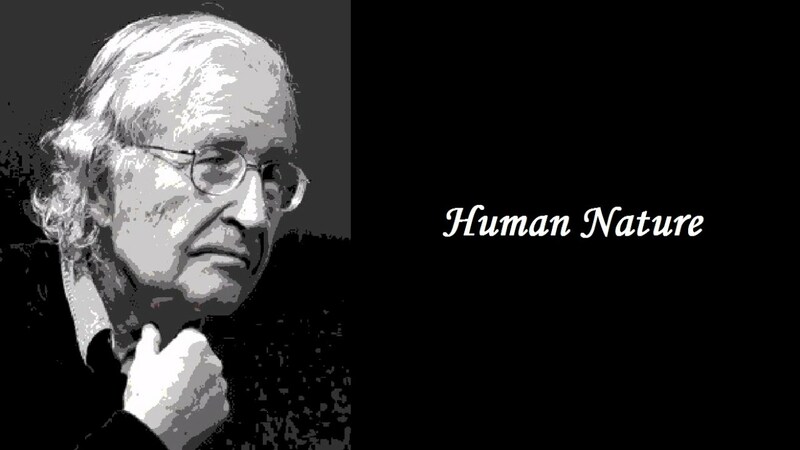 It depends on how strong we take Chomsky’s modal term “capable” ( as in “human essence to be capable of learning...”) to be. Take the letters “H” and “L” as standing for “is human” and “is a user of specified language L”. So Tony Blair (if at another possible world, W, at time t) might have come across the required stimulations that engendered the use of language L. However, this conclusion still relies on Chomsky’s stipulation of the sortal [human] and his further stipulation that the language-use of L is the essence of humanhood. Of course we need to accept such a stipulational definition of the sortal [human] in order to make sense of humans at other possible worlds. And even if we accept Tony Blair via the sortal [human] at other possible worlds, the possible entities would still not be Blair qua Blair at these worlds. It's essential that Blair - via the sortal [human] - is capable of learning language L, or even Blair qua individualised particular (to use Leibniz's term) that he's capable of learning language L. If Blair had existed at another possible world only via the sortal [human], it wouldn't actually be Blair at that other possible world because what makes Blair, Blair, is the individualising of him as a particular. Perhaps Blair has (or has had) Lewisian “counterparts” at other possible worlds; though, again, only via the sortal [human] or via the sortal [person] (or via any other lower-order sortal). Blair via Chomsky’s sortal [human] at another possible world would be an entity of some kind: a human, who might have - or has - learned language L... and that’s it. Period. (If, of course, the sole criterion of Chomsky’s sortal [human] is that it must be capable of learning language L.) Blair qua human or qua person wouldn't necessarily have the same shape, size, beliefs or dispositions as Blair at our actual world. So what right have we to say that Blair qua Blair exists at other possible worlds? We could accept, for now, a “counterpart”; though that counterpart wouldn't share with Blair what makes Blair an individualised particular. In that case, possible Blairs could only share the sortal [human] and the quasi-sortal [language-user-of-L] with actual Blair, according to Chomsky’s stipulations (which are very thin). We could apply more criteria of identity to the sortal [human]; but that wouldn't allow the multiple instantiations (as it were) of Blair qua Blair at other possible worlds. And if possible Blairs aren't Blairs who've been individualised as being Blair, then there could be no genuine possible Blairs at other possible worlds. The sortal [human] could also be stipulated to include the individualising micro-sortals [tool user] and [entity with two legs]. Blair shares these conceptual requirements with all other humans on earth. So Blair as an individualised particular couldn't have possible world duplicates; though he could have, as said, Lewisian counterparts. What makes Blair, Blair, is that he's taken qua Blair (i.e., taken as an individualised particular). And part of the individuating conditions of Blair qua Blair at another planet (not another possible world!) is the fact that he was brought up on an uninhabited planet where the required stimulations needed for learning language L weren't there. And, of course, if there were a possible world that's also the exact duplicate of Blair’s world (i.e., ours), and Blair’s planet (ours), and a world that also duplicated both Blair’s our-world conditions and Blair himself, then such a world wouldn't work as a possible world as they are generally understood. If worlds are “ways things could be or could have been” (Lewis, 1973), then this duplicate possible world W is a duplicate of the actual world. Therefore it wouldn’t be an example of “how things could be or of how things could have been”. This world W would be identical to our world, and therefore actual Blair’s essence couldn't be found by investigating (or stipulating) a possible Blair at world W. One of the main points of possible worlds, therefore, disintegrates. This is the only way I can think of where we could find actual Blair’s essence – by investigating or stipulating other possible worlds which aren't duplicates, rather than investigating Blair’s essence qua Blair (as an individualised particular). We couldn't find actual-Blair’s essence via the sortal [human] or the sortal [person]. These sortal essences don’t provide us with the essence of actual Blair qua actual Blair. Perhaps, again, Blair doesn't even have non-identical counterparts at other possible worlds. After all, what if a particular counterpart, c¹, shares humanhood with actual Blair? c¹ would also share humanhood with every other human on earth. Similarly, if c¹ shares personhood instead with actual Blair, then he must also share personhood with every other person on earth. And the same is true of lower-level sortals such as [two-leggedness] or [those who believe in God]. c¹ would share these thinner sortals with billions (though not all) persons on earth, and indeed at other possible worlds. Though when we come to c¹ sharing properties with actual Blair that he doesn't also share with numerous other people on earth (or even with just one single person), then c¹ would also need to live at world W with its duplicate conditions. And, as said, such duplications wouldn't serve the explanatory and modal purposes that possible worlds are supposed to play in defining and determining essences across possible worlds: i.e., what actual-Blair must share with all possible-Blairs is what constitutes his essence. Chomsky, Noam. (1986) Knowledge of Language. Lewis, David. (1968) 'Counterpart Theory and Quantified Modal Logic'. -- (1973) 'Possible Worlds', from Counterfactuals.